Tip of the day: Learn to cook. This may seem like obvious advice, being that this is a cooking blog, but I don't just mean be able to read a recipe and put all the ingredients together to make a meal. I mean really get to know your food. Learn what goes with what — which herb goes well in what sort of dish, which sauce can go on which pasta, what flavors taste amazing with other flavors. Learn cooking times and cooking methods until what you're doing in the kitchen when preparing a meal is almost entirely automatic. Doing this can really help when you've got an odd assortment of food in your fridge or your cupboards are feeling practically bare — it'll save you the expense of going out to eat! The dish pictured above was made up entirely out of my head. No recipe, other than the vague memory of recipes that inspired the final outcome. I've had some leftover mung bean noodles sitting in the fridge for about a week, and it was high time I got around to using them up. I'd originally used the noodles to make pancit, a Filipino noodle dish, but I hadn't been entirely happy with the results. (It's hard to get food to taste just like your mom's!) So I wanted to try something new. The noodles were a little firm from being in the fridge for so long, so I refreshed them with some boiling water. Then I stir-fried them in a pan to cook off any remaining water. I mixed up a sauce that I normally use to dress stir-fried asparagus or long beans, from Into the Vietnamese Kitchen, which involves oyster sauce, patis (fish sauce), and sugar. I didn't measure — I just added different amounts till it tasted good. 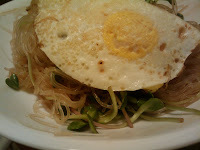 After removing the noodles from the pan, I threw in some sunflower sprouts and wilted them with the sauce. I added that to the noodles, but then decided there weren't enough greens in there, so I just dumped what little was leftover of the sprouts, uncooked, and mixed them in. Something seemed missing. One of my favorite breakfast foods is a bowl of rice with a fried egg on top, sprinkled with a little oyster sauce. An fried egg seemed like the perfect topping for this very simple, light noodle dish. I've been doing a lot of cooking like this lately: taking whatever I've got around the kitchen and throwing it all together to make something delicious. I'll write more in the future about the kinds of things I've been whipping up, so that you can learn to do this, too.